Check out my other listings. 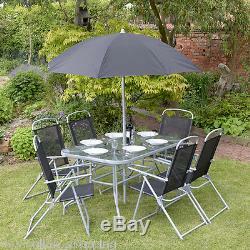 Garden Patio Furniture Set 4 Seater Dining Set Parasol Glass Table And Chairs. A sleek, contemporary design, this outdoor furniture set is made from silver coated tubular steel, which makes it hard wearing and long lasting. This versatile outdoor dining set includes 6 folding mesh chairs, a rectangular table with glass top and parasol hole and a co-ordinated black umbrella to provide shade and shelter. 8 piece garden furniture set. Stylish black & silver design. 1 x rectangular glass table. 6 x folding textolene mesh chairs. 1 x black garden parasol. The table measures 70cm high x 70cm wide x 120cm long. The chairs are 78cm high x 45cm x 49cm. The parasol is 120cm wide. To order and pay by card please call 01506657487 Ordering Online with us is safe and secure. If paying via cheque or postal order there will be a delay until the item clears All our charges include VAT at the standard rate (except exempt/zero rated items) and a receipt detailing the VAT paid is provided. If you wish to pay by Credit or Debit Card please enter your card details at the checkout. Terms and Conditions Your Statutory rights are not affected by any of the following store policies. To order and pay by card please call 01506657487. Cards are processed securely using a Secure Payments service and we do not make a record of your card details. Please note that we do not work the weekend so all parcels ordered within this time will be dispatched the following Monday. We will report the loss to the carrier who will contact you to confirm the circumstances. Postal Losses and Damage We offer FREE cover against loss or damage in transit for UK buyers. In the event that your item is lost or damaged in the postal system we will replace the item free of charge (see details above). We may ask for photographs of any damage and must be submitted within 24 hours. Please include a note with your return with your name and address to help us speed up the process. We want you to be completely satisfied every time you shop with us. Occasionally though, we know you may want to return items. This applies to all of our products. Your Right To Cancel You do not have to give any reason for cancellation. However, a brief explanation will help us to improve the service we offer to customers in the future. Please do not return the item until you have heard from us. If you fail to return the goods, we will collect them, and we will charge you the direct cost of collection. The above policies do not affect your statutory rights. Important Please ensure that your return is made via an insured and tracked service in case of loss or damage in transit. All goods will be inspected on return. The goods are your responsibility until they reach our Warehouse. Please ensure you package your return to prevent any damage to the items or boxes. Power Tools & Air Tools: are covered by a return to base guarantee against faulty materials or workmanship for 12 months (60 days in the case of tools used in the hire trade or commercial trade) from the invoice date. All other products: are covered by a return to base guarantee against faulty materials or workmanship for 12 months (60 days in the case of tools used in the hire trade) from the invoice date. Normal Wear & Tear The above guarantees do not apply to fair wear and tear or damage caused by misuse or abuse of the products. Prices Goods are charged at price shown on the product pages on the date the customer places the order and are inclusive of VAT. Prices are correct at time of publication Errors and omissions are excepted. Orders will be processed at our published prices, otherwise, in the case of any unexpected change in price, you will be informed and asked if you wish to reconsider your order before proceeding. It will then be dealt with confidentially, and effectively. Company Registration Information Registred Office Address: SHS TRADING LTD UNIT 19 & 20 ENET PARK MILL ROAD IND EST LINLITHGOW BRIDGE EH49 7SF Registered in Scotland No. SC445114 Vat Number : 993218492 Statutory Rights Your Statutory rights are not affected by any of the terms and conditions. Services and Conditions of Use As part of our service, we agree to provide you with information and other services that we may decide to offer, subject to the terms of this agreement. Upon notice published through the service, we may modify this agreement at any time. You agree and continue to agree to use our services in a manner consistent with all applicable laws and regulations and in accordance with the terms and conditions set out in the policies and guidelines outlined below. Please note that you will be referred to as'customer' in this agreement. Rules For Online Conduct By using the service, you agree that you will not attempt to undermine the integrity of this web site. SPECIFICALLY, WE DISCLAIM ANY AND ALL WARRANTIES, INCLUDING WITHOUT LIMITATION: 1 ANY WARRANTIES CONCERNING THE AVAILABILITY, ACCURACY OR CONTENT OF INFORMATION, PRODUCTS OR SERVICES; AND 2 ANY WARRANTIES OF TITLE OR WARRANTIES OF MERCHANTABILITY OR FITNESS FOR A PARTICULAR PURPOSE. CUSTOMER SPECIFICALLY ACKNOWLEDGES THE SERVICE IS NOT LIABLE FOR THE DEFAMATORY, OFFENSIVE OR ILLEGAL CONDUCT OF OTHER CUSTOMERS OR THIRD-PARTIES AND THAT THE RISK OF INJURY FROM THE FOREGOING RESTS ENTIRELY WITH CUSTOMER. CUSTOMER HEREBY ACKNOWLEDGES THAT THE PROVISIONS OF THIS SECTION SHALL APPLY TO ALL CONTENT ON THE SERVICE. Trademarks All trademarks appearing on the service are trademarks of their respective owners. Security This site has security measures (SSL Certification) in place to protect the loss, misuse and alteration of the information under our control. All data is protected using the most advanced methods available. S and quad-bikes, are dangerous. Please wear safety equipment at all times when using bikes or similar machines. The use of any powered vehicle could involve the risk of injury or death. Please use these products in a responsible manner. The products that we supply are technical & mechanical products, which require mechanical knowledge and skill to use and maintain. None of the bikes we provide are'road legal' and are not for use on the public highway. These bikes are intended to be enjoyed on private property. Use of these bikes on a public highway could result in criminal proceedings. Please note customers will be expected to fit parts themselves, guidance will be available on technical issues. If the Item subsequently turns up we may ask you to return it to us at our cost. Power Tools and Air Tools: are covered by a return to base guarantee against faulty materials or workmanship for 12 months (60 days in the case of tools used in the hire trade or commercial trade) from the invoice date. Normal Wear and Tear The above guarantees do not apply to fair wear and tear or damage caused by misuse or abuse of the products. This listing is currently undergoing maintenance, we apologise for any inconvenience caused. The item "8Pc Garden Patio Furniture Set 6 Seater Dining Set Parasol Table And Chairs" is in sale since Thursday, March 23, 2017. This item is in the category "Garden & Patio\Garden & Patio Furniture\Furniture Sets". The seller is "365-online_shopping" and is located in Bathgate. This item can be shipped to all countries in Europe.